Having friends and family over for pizza makes for a delicious hassle-free vegan meal. Pizza night with friends is always fun; good conversation, tasty food and occasionally a game of Jenga. I prep all the vegetables and have the dough ready so when company comes over, people can pair up halving a pizza for themselves with whatever toppings they want. I even let veggies bring cheese. Hey- it's their pizza! Mix dry ingredients together. Slowly add the warm water and form a ball. Let stand for about 15-20 minutes before rolling out. It's a pretty basic recipe. I like to put dried basil, oregano and thyme into the dough for more of a herb crust. Delish. The tomatoes look like a smiley face! For my friends Birthday last week I wanted to make something healthy and so delicious that it would 'wow' my audience that it was vegan. I have made this recipe multiple times for various guests and it has always turned out perfect. This is another VegWeb original. Go impress spectacle omnivores and make this! They will be so surprised that there isn't ricotta in it! Chocolate Cupcakes with Chocolate Peanut Butter frosting followed dinner. Balancing classes, homework and teaching I often grab a granola bar when I'm on the run. As much as I love the granola bars Kashi has on the market, I thought it would be fun to try and make my own. Not only was this recipe easy, but it was nice to modify and put what I wanted into the mix. I chopped up some almonds, sunflower seeds, raisins and some dark chocolate chips. Wonderful! Pre mixed trail mix would work fine in this to save time. After cutting them into bars, I put the remainder in the freezer. They keep well and are perfect to grab as a breakfast on the go or a snack. I've also thought of crumbling a bar up and putting with some soy milk or yogurt. 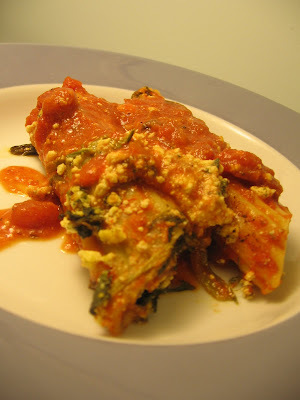 Check out the recipe at Vegweb! Asparagus ranks toward the top of my favorite vegetables. Not because it makes your pee smell, but it's really nutritious! Asparagus is rich in potassium, folic acid and dietary fiber. Plus, it's low in sodium and pretty dang tasty. Chop all ingredients and prepare oil in pan, adding garlic once it's heated. Add vegetables and saute until al dente. Add all ingredients into pan with the vegetables, tossing gently. Pour water into pan while stirring. Once to the right consistency, serve over whatever pasta or rice you'd enjoy. After the snow last night, our morning walk was just beautiful. For as much as I complain about the snow- it is pretty. I can't remember the last time I had nachos... I love chips, salsa and at one point really enjoyed nachos. Minus the cheese, who wouldn't want to devour a plate of warm chips, black beans, tomatoes, avocados and corn? Just because nachos call for cheese, it definitely didn't stop me from re-creating an oldie into a delicious healthy veganized dish! Woot woot! 1 cup salsa - I like Mrs. Renfro's salsa, delish! a lil' crushed red pepper - optional, but a nice kick. Place salsa in a sauce pan, add nutritional yeast and other spices then water. Simmer until you've reached a melty consistency that is ideal to pour over your chips and vegetables! Enjoy!